Jerry Thomas organized cocktails in his bar manual 7 years before Dimitri Mendeleev organized the chemical elements in the first periodic table. So since 1862 the idea of dividing cocktails into groups like sours, flips, fizzes and punches has existed. 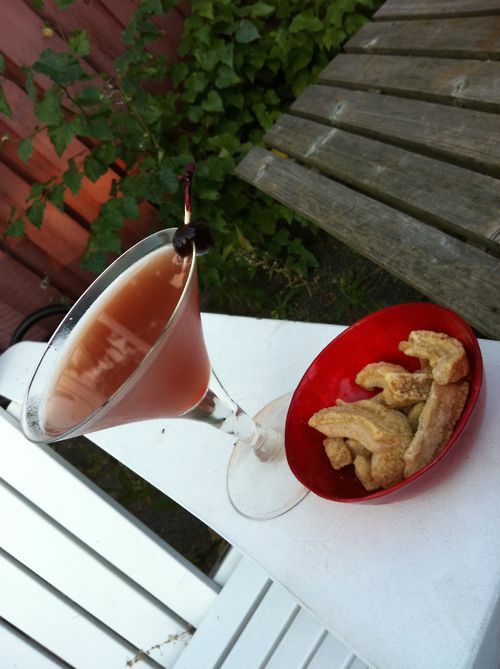 The whisky sour is the cocktail equivalent of carbon. Shake everything with ice and strain into a low ball glass or a whisky tumbler. Garnish with a lemon twist. Having procured a bottle of Martin Miller's gin I looked around for something to test it with and stumbled across the Fin de Siecle cocktail. 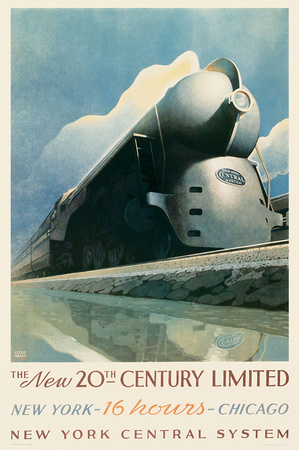 Apparently created in the 1920'ies in honor of the previous turn of the century. 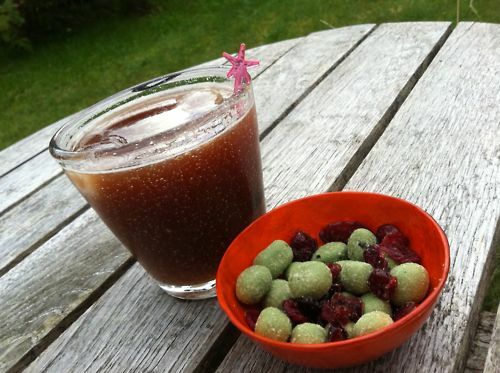 This cocktail contains Picon, a orange bitter liqueur that is poured into beer in some parts of France for a very refreshing Picon biere. Stir the first three ingredient with ice in a mixing glass until your cocktail is very cold. 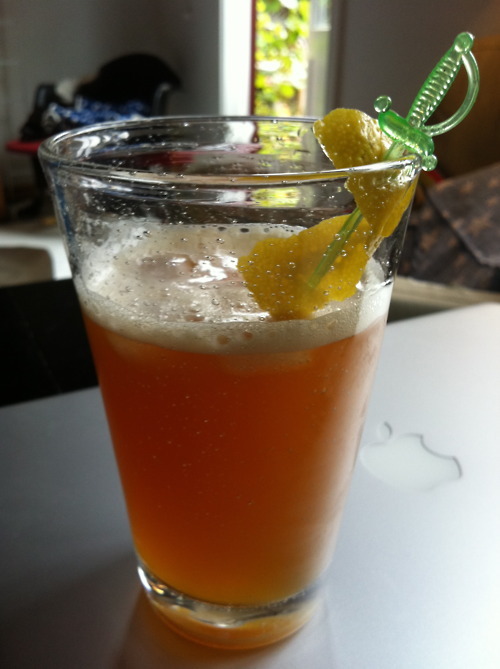 Strain into pretty cocktail glass, add the dash of orange bitters and a twist of orange. Much like synchronized swimming I have a hard taking Tiki-cocktails seriously. There's much to be giggling and pointing fingers at, but at the same time I have this strange feeling that the laugh is on me, so I do try. And was happy to come across The Pago Pago that involves one of my favorite liqueurs Chartreuse. Also it does not seem to have that over the top amount of ingredients that sometimes make me suspect that the main attraction to Tiki-drinks is to get drunk really, really fast. Start by muddling the pineapple, with the lime juice, the Chartreuse and the creme de cacao in a shaker. The object is to get all the juice out of the pineapple. Then add ice and rum and shake. Strain into cocktail coupe and garnish with a piece of pineapple and a maraschino cherry. I am trying to comprehend jelly shots as not just something for people who don't like booze can eat and get really drunk from. I can certainly see their aesthetic appeal, when I see pictures like these. But I'm still not sure I get them. I had a few mandarins quickly loosing their appeal and figured I had better juice them, that done I remembered Jelly Shot Test Kitchens candy corn shots and figured I could do something similar, but with only two layers. The gelatine I carefully dissolved in the water over slow heat stirring pretty much constantly. The three alcohols I mixed in a bowl and once the gelatin was completely dissolved I poured the warm liquid into the booze and poured a bottom layer into my molds. And put them into the fridge. I dissolved the gelatin in the mandarin juice over slow heat and then poured it into the Cointreau with the dash of orange bitters added. By then the opaque layer was completely set and I could fill up the molds with this orange liquid. Put all ingredients in a shaker with ice and shake vigorously then strain into small glass or in my case a small glass bottle. Since a single mandarin had showed itself to have eating qualities I turned that into a bar snack by wrapping thin strips of a good quality fried bacon around the sections. Who wouldn't want to taste the favorite cocktail of Laurel and Hardy? I certainly would. 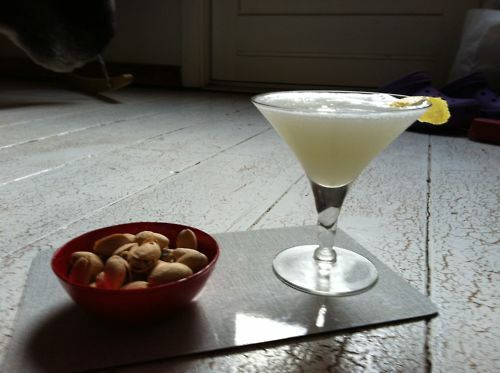 The origins of the White Lady are - as with most cocktails - obscure, but it's down to the two Harries: It's either invented by Harry MacElhone at his bar in Paris or by Harry Craddock at the Savoy Hotel in London. Essentially the White Lady is a sidecar, where gin replaces brandy and with an egg white add for smooth texture and wonderful soft foam. Put everything in a shaker, and shake for a minute. 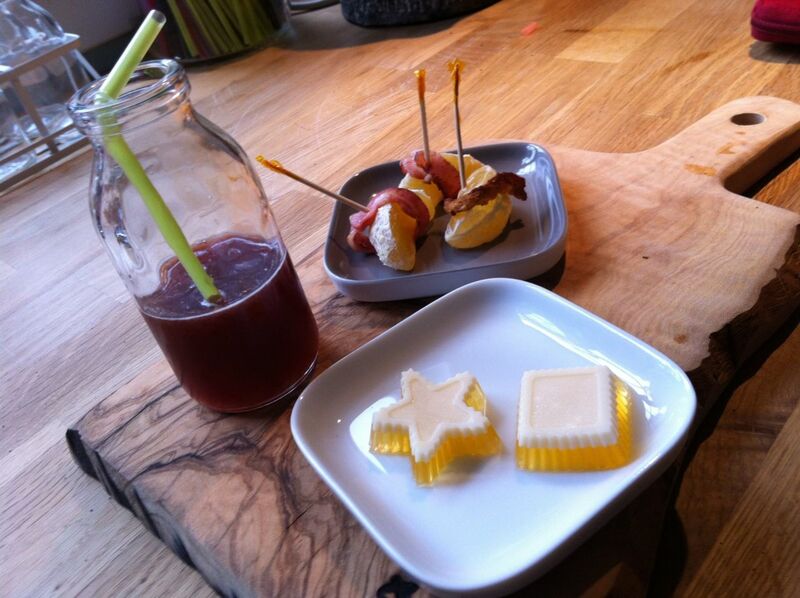 (Dry shake makes the emulsion of the egg to lemon juice easier) then add ice and shake for another couple of minutes. Strain into martini glass og cocktail coupe. Garnish with lemon. 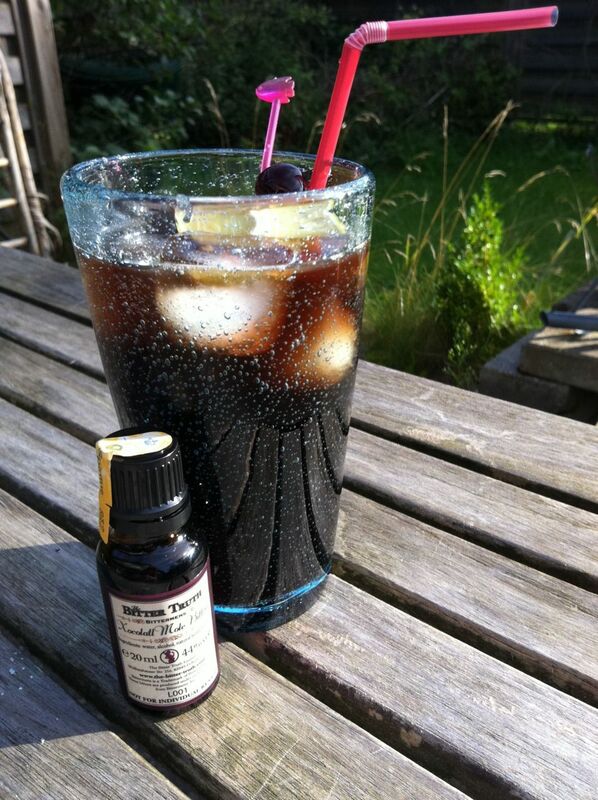 The name of this cocktail comes from a dark chapter in modern medicine. In the 1920'ies a Russian-French doctor performed a series of xeno transplantations, where he put tissue from monkey testicles into mens testicles. He predicted that would make the men more virile, but it didn't however the procedure was popular, more than 1500 men had it performed. Among them apparently the founding father of modern Turkey Kemal Atatürk. 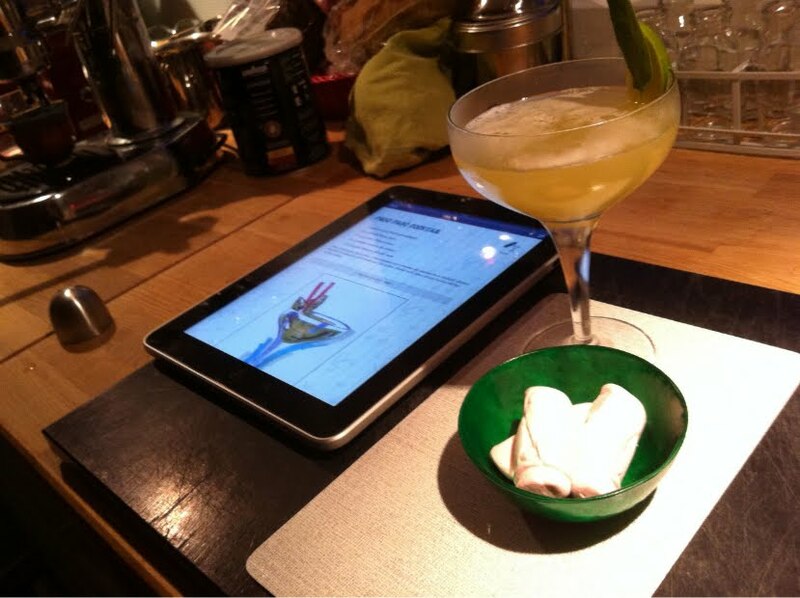 The procedure made it's way into popular culture: Songs were written, cocktails mixed and articles written. 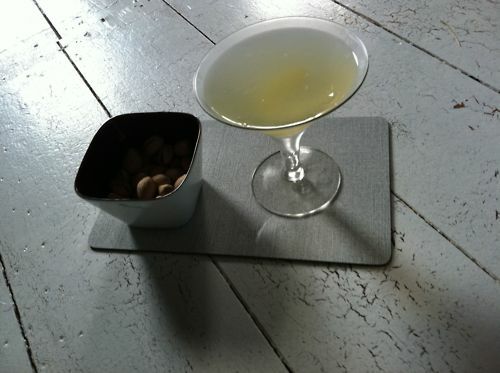 Stir everything with ice and strain into martini glass. 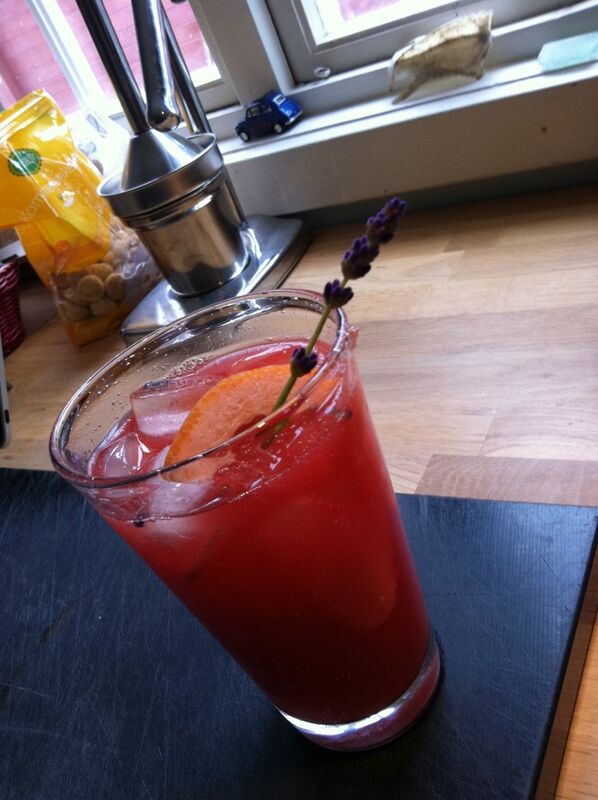 Garnish with orange twist. The morning after has always given rise to alcoholic and non-alcoholic remedies. 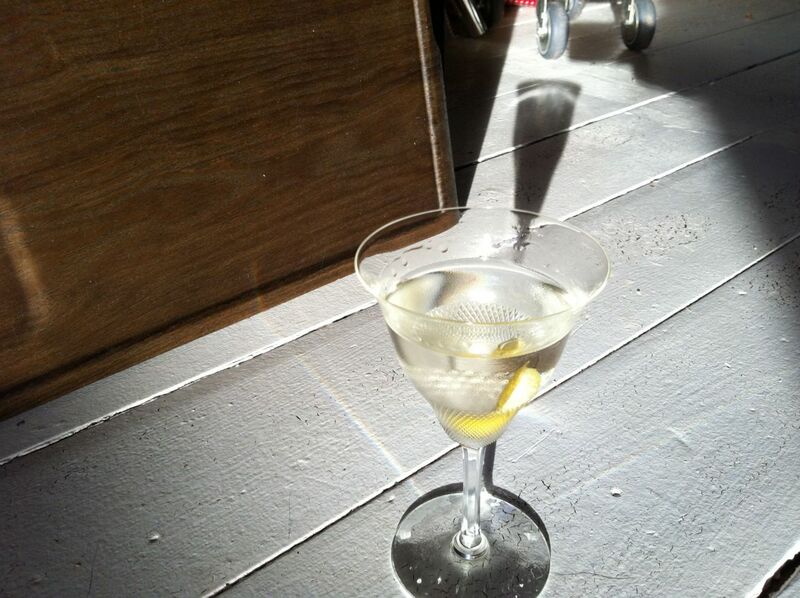 Harry Craddock's Corpse Reviver II is by far the most tasty way to rise by the tree that felled you. Four of these taken in swift succession will unrevive the corpse again. This cocktail evolves around a herbal liqueur that has both an amazing color and an amazing taste: Green Chartreuse. 130 herbal extracts form this very complex and potent ingredient, made by monks since the 1740's. As the Edwardian writer Saki had one of his protagonists say in 1904: People may say what they like about the decay of Christianity; the religious system that produced green Chartreuse can never really die. 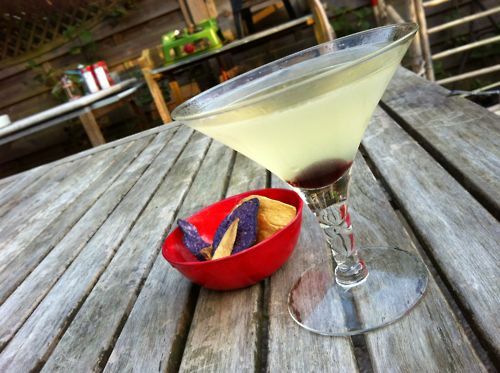 The Last Word is a perfectly balanced cocktail, but more than two will get you in trouble as the Green Chartreuse has a whopping alcohol content of 55 percent - i.e. more than the gin also needed for the cocktail. 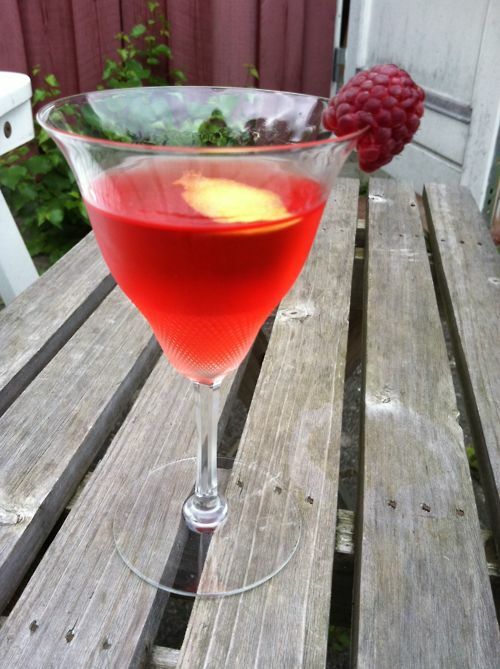 Shake everything over ice and strain into martini glass - garnish with nice edible flower or a lemon twist. 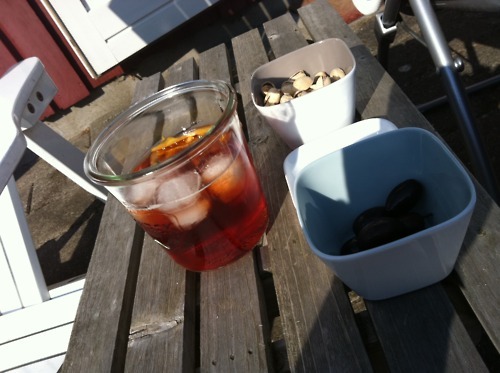 Cherry wine is a really old tradition in Denmark going back to the 17-hundreds. When I was young - before Bacardi Breezer's - teenagers first got drunk on either beer or cheery wine. Since then cheery wine went completely out of fashion and is not even brewed as such very many places any more, mostly its watered down spirits with artificial cherry color and taste. 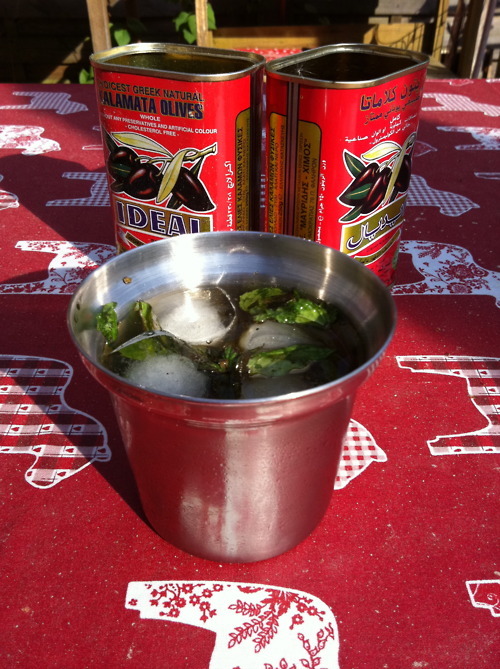 Everything in a tall glass full of ice and then garnish with a slice of lime and a couple of Maraschino cherries. A truely retro taste! For my birthday I decided to mix "my own" cocktail. I surprised even myself by not using gin as the base spirit, but I got inspired from a 300 year old Danish poem called strong coffee. It was written by Ambrosius Stub (a very fitting name as Ambrosia is the Greek God of food and drink) at a point in his life when he had lost everything to drink - well fortunately not the ability to write poetry. He wrote his poem not long after coffee was introduced in Denmark and with it the mixture of coffee and snaps (akvavit). Coffee without snaps was weak coffee and coffee with was strong coffee. In his poem Ambrosius Stub laments the power of strong coffee to burn the blood and ruin your resolve. Mix the first three ingredients in shaker and shake long and hard. 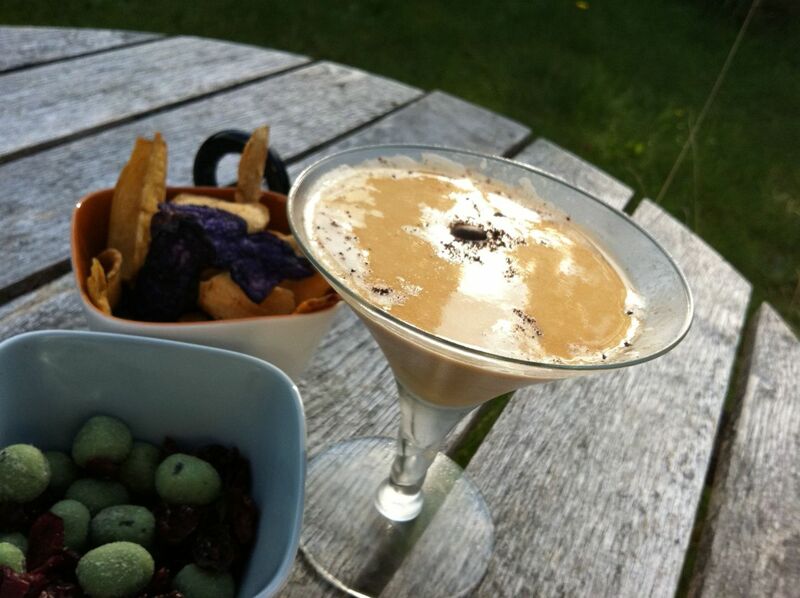 Strain into ice cold martini glass, add a dash of chocolate bitters and gently grate the coffee bean on top as a garnish. Then drink to Ambrosius Stub! 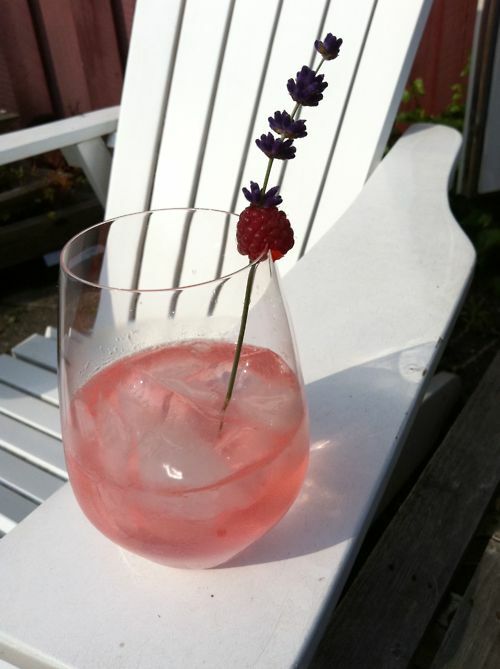 In Denmark we have a special tradition for drinking bitter - yes we drink it, not just as a dash in a cocktail. For especially older Danes bitter is part of a traditional breakfast of black coffee, a soft boiled egg and half a slice of rye bread, buttered Danish breakfast rolls with cold cuts or cheese, Danish Pastry and then that little glass - same ones we drink snaps (Akvavit) from for lunch - full of a sharp, dark bitter. One of the most famous local ones is called Old Danish, but then there are the German bitters Jägermeister and Underberg and the Italian Fernet Branca. So I have some prejudices towards bitters, right? 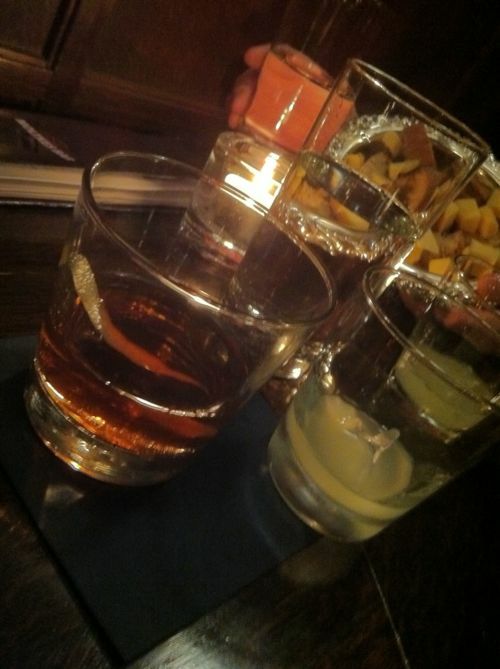 So I looked for a cocktail with Fernet Branca and came across Kingston Club by Jeffrey Morgenthaler. I would have thought Fernet Branca needed to be matched with dark earthy flavors but he goes the completely opposite direction, and with great success. Shake first five ingredients over ice, strain into tall glass filled with ice and top off with the seltzer, garnish with lemon twist. Does anyone name cocktail after movies, sports stars or other popular culture markers today? 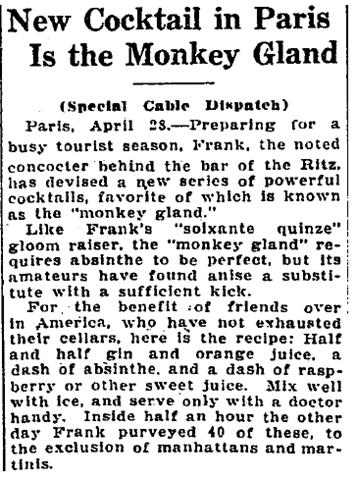 I don't know but it seemed to be very common in the golden age of cocktails. So what to think about this cocktail that does look a bit murky? It's named after a 1922 movie starring Rudolph Valentino. In it he played a bullfighter, and the cocktail represents the mixture of spilled blood (from the bull of course not out hero) and the sand covering the bottom of the bullfight ring. Shake over ice and pour into a low ball glass. Garnish with maraschino cherries of fresh if in season. 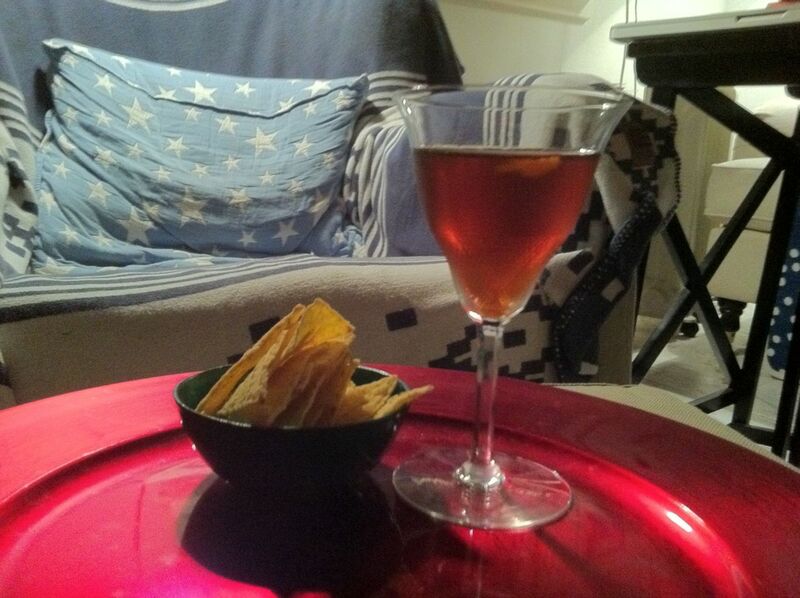 In the early days of cocktails it seemed to be quite easy to invent one. 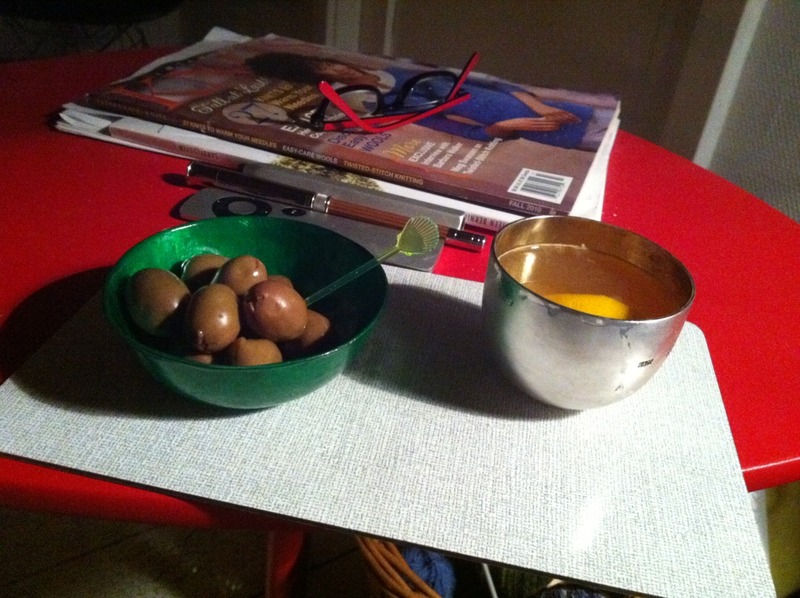 Take the Gibson - the only difference between a Martini and a Gibson is that the olive is exchanged for an onion. It does have a nice little history though. So the challenge of this cocktail is getting a good cocktail onion, and the best way is to make it yourself. Stir everything with ice if you want a completely clear and translucent cocktail, strain into martini glass and garnish with cocktail onion. 3 dl white vinegar - I used a mixture of Japanese vinegar, champagne vinegar and white wine vinegar. 1 teaspoon pickling spice, a tiny ear of star anise and a cardamom pod. Put everything in stainless steel pot, bring to boil and boil for 1 minute. Pour into clean glass and put in fridge. Ready to use after 24 hours, but gets better over time. This cocktail is almost holy - at least in New Orleans - and I'm a bit awed a trying to mix it these 7.976 kilometers to the north-east of it's birthplace. 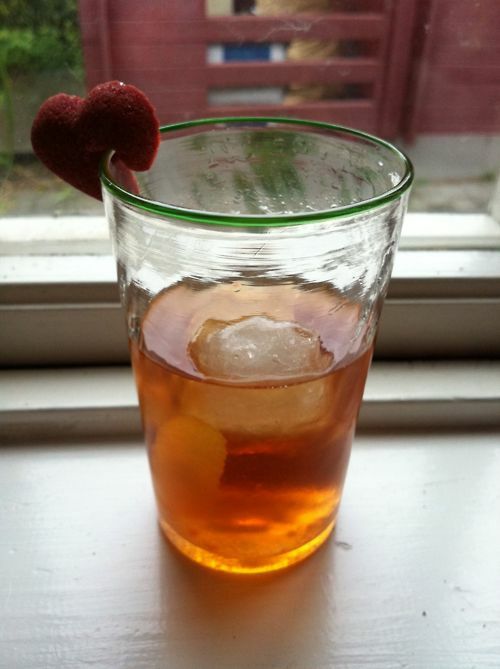 It's actually an Old Fashioned with a little something special. In mixing glass but the bitters over the sugarcube and muddle, add the rye and muddle further until the sugar is dissolved. The get a low ball glass and rinse it with a few drops of absinthe, add a couple of large ice cubes and pour cocktail into glass. 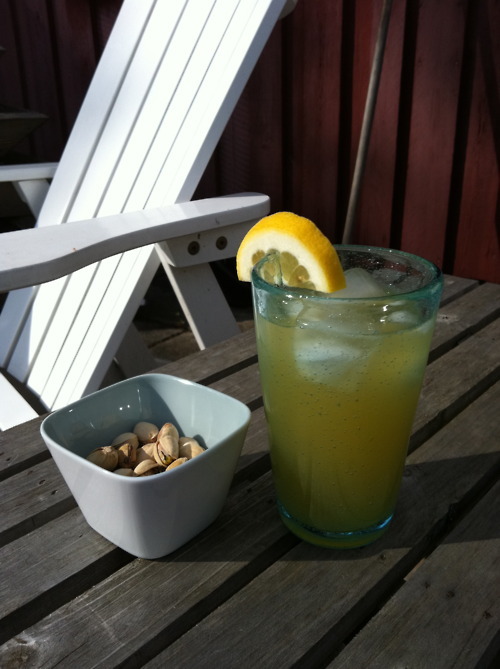 Stir to make it cold and garish with a lemon twist. This is the kind of cocktail than rounds a stress full day of perfectly or lends itself to a warm summer night on the patio after sunset. I first tasted this cocktail a humid summer night in the wonderful cocktail bar Ruby in Copenhagen. It was love at first sight/taste and I remember feeling happy that it contains raspberry syrup, because I love making that. Our very knowledgeable bartender Nick Kobbernagel Hovind told us the story of how this gorgeous pink cocktail was once the favorite of the patrons of a gentleman's club in Philadelphia back when pink was not a girly color. It's a cocktail containing egg white, something that seems to freak out a lot of people. I'm so old that in my childhood my brother and I was regularly given a cup with an egg and sugar and then we stirred until it was fluffy and almost white and no "sound" could be heard from sugar crystals caught between spoon and cup. We lived to tell the tale and I have complete faith in the nice people who sell me eggs. 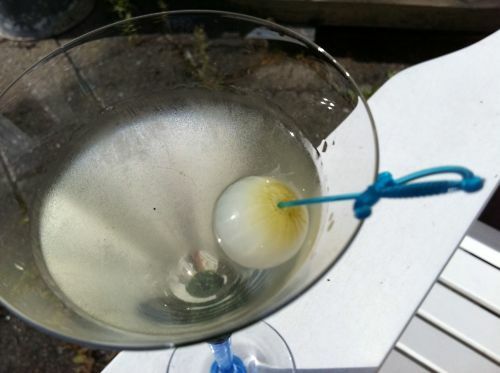 Others fear they can't shake it hard enough and will encounter the egg white as a blop of slime at the bottom of the cocktail glass. Fear not, just follow the instructions. Add all ingredients to a cocktail shaker and do a one minute dry shake. Then add ice and shake for a further two minutes. Strain into glass taking care to layer the gorgeous white foam on top. * Raspberry syrup: In a small sauce pan add a good handful of fresh raspberries, half a handful of white sugar and 1 dl water. 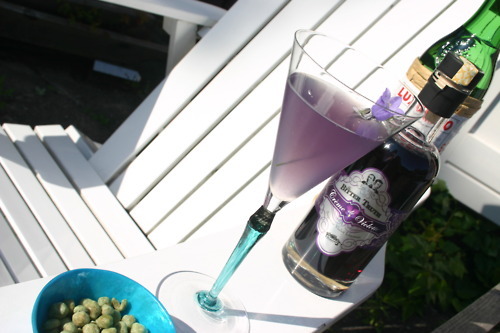 Also add a sprig of rosemary, a twig of lavender and a piece of star anis. Bring to a boil and let boil for about 2 minutes. Strain and press all liquid of the pulp of fruit with the back of a spoon. Pour into small bottle and let cool. I've never been anywhere near Burma, and have no doubt that Burma under British rule was a pretty dismal place for a majority of the Burmese. But every Dane of my generation, have this very romantic vision of Burma, because of and a very corny old Danish hit song Mandalay (Yes, it's Kipling's poem translated into Danish). Every Sunday I heard this song on the radio all through my childhood. What makes this song so perfect for this cocktail is that the four gentlemen singing it all had a true fondness for drink, and most of them died from it. They would have loved a Pegu Club Cocktail. Add everything to mixing glass, add ice and stir until well chilled. Strain into your most beautiful glass. 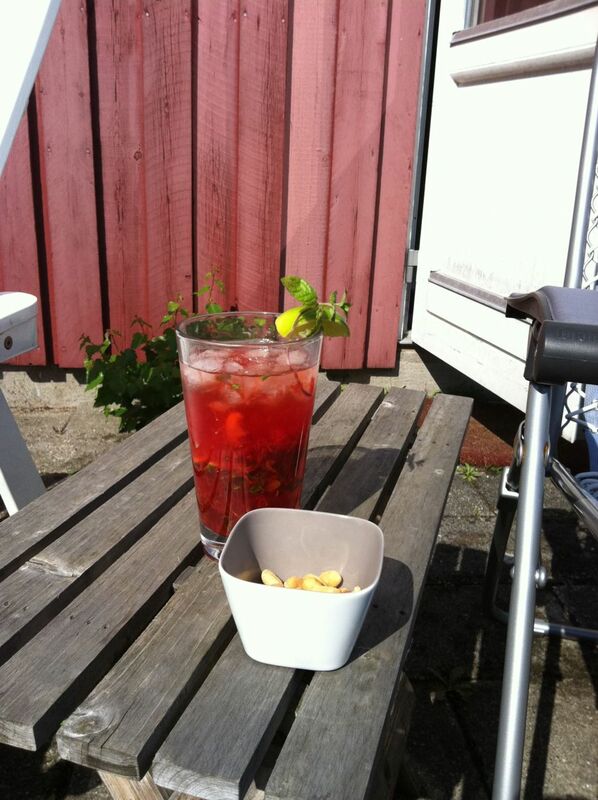 This is a perfect pre-sundowner, and takes advantage of the perfect strawberrys sold in Denmark between late May and late June. I wouldn't make it with imported or - heaven forbid - frozen berries. 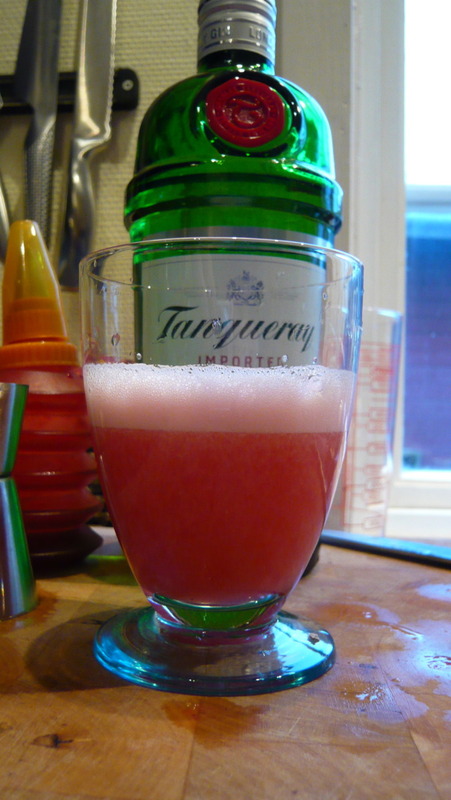 Muddle strawberries, mint and lime in the bottom of a high ball glass. 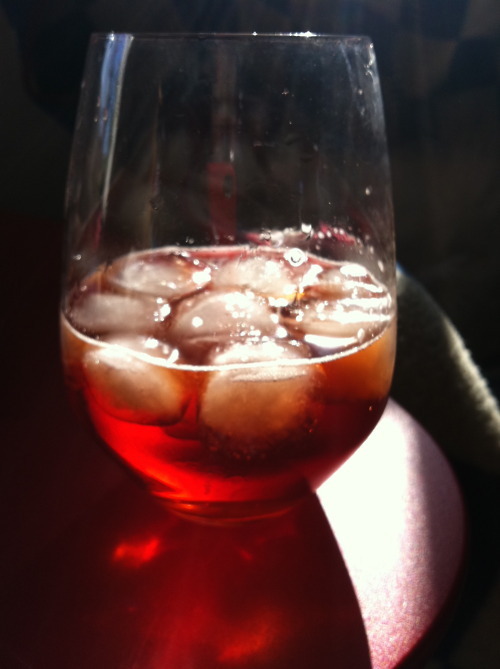 Add Campari, champagne and crushed ice. Stir until the outside of the glass feels very cold. Garnish with lime and fresh mint. 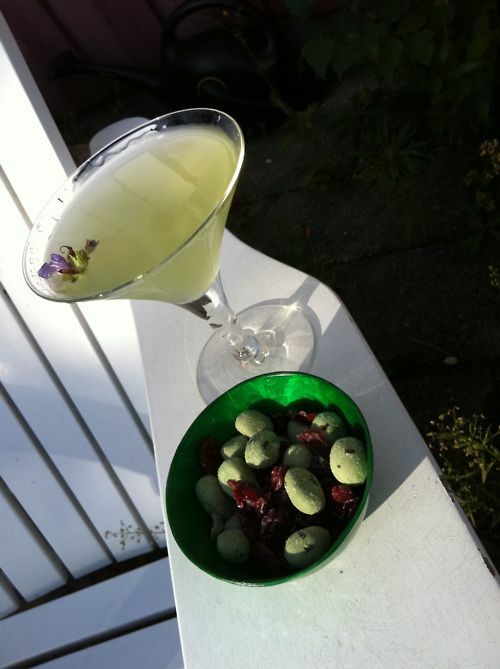 This signals late spring early summer to me, when pea pods are everywhere: Discarded ones on the street, fresh ones in the shops and some in my cocktail kitchen. Lightly blanch the peas in unsalted boiling water immediately transferring them to cold water. Muddle 13 peas with the honey and 2 bay leaves in a shaker. Add ice, the gin and the lemon juice and shake well. 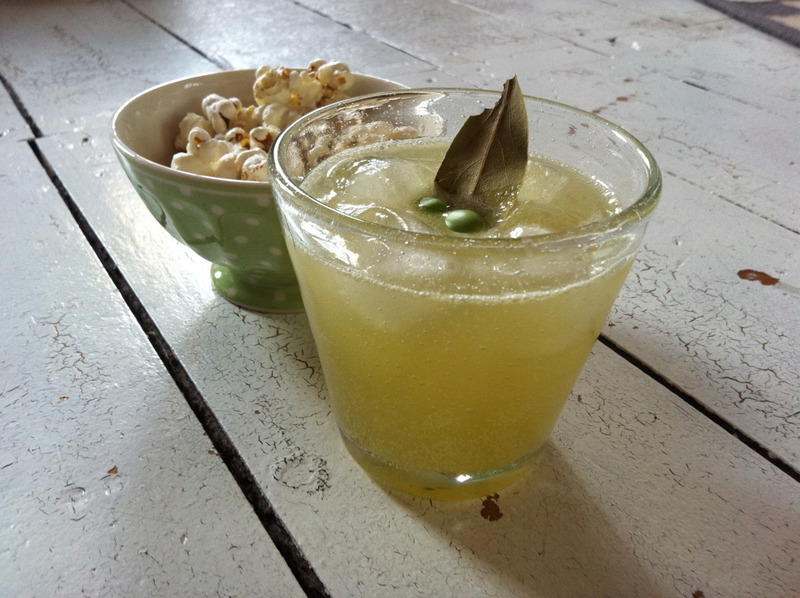 Strain into a low ball glass and garnish with the last 2 peas and the remaining bay leaf. 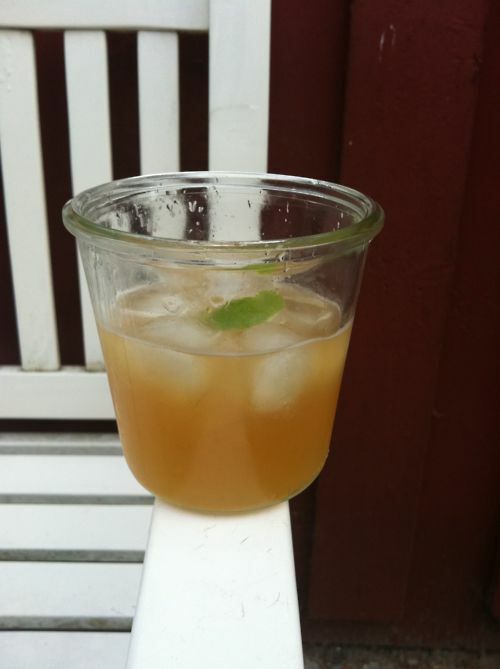 In the bottom of a low glass place the sugar cube and add the drops of Angostura bitters, mix and muddle with a muddler or the handle of a wooden spoon. 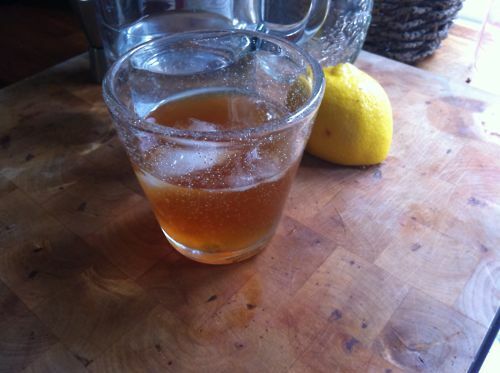 Add bourbon and ice, using a bar spoon stir until cocktail is cold. Garnish with a sprig of blossoming chives place on cocktail napkin.